The Kardashian game takes users inside Hollywood, guided by a virtual Kim who offers advice on how to become an A-list celebrity, starting from the so-called E-list. “Dating famous people will get you more fans, too,” instructs Kardashian, who in real life is married to rap singer Kanye West. 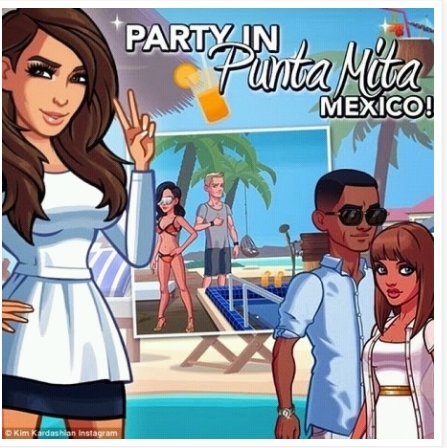 While the game is free to play, the goal is to get users hooked on in-app purchases such as clothing or a burst of energy needed for traipsing through Hollywood. Users can spend as much as $99.99 for 175,000 virtual dollars. A trip to Beverly Hills costs 4 game “dollars,” while 400 will buy a necklace. Kardashian’s voice guides the uninitiated through casting calls and parties, while users dodge surly tweets from rivals. The game gives Kardashian’s most fervent fans a new way to satisfy their appetites, de Masi said. Annual revenue from Kim Kardashian: Hollywood may reach $200 million, estimates Douglas Creutz, an analyst with Cowen & Co. in New York, who has the equivalent of a buy rating on Glu Mobile and expects the stock to rise to $6 in the next year. It’s the only title among the top 10 in the App Store with a five-star rating, the highest possible, based on thousands of user reviews.